How are we saved? This mystery of the grace of God is one that people are constantly trying to understand better. James has been discussing the importance of acting on the faith that we have, so now he makes an important distinction for salvation. Read James 2:24-26. Now that verse can seem in contradiction to the idea that our works can’t save us. However, this is actually a key part of the process of salvation. You see, salvation can be thought of in three parts: sanctification, justification, and glorification. Sanctification is the initial moment in time when each person makes a decision to trust in Jesus Christ as his Savior. Ephesians 2:8-9 explain that moment is all about God’s grace toward us through our faith in Him. Our actions and works do not lead us to that moment, only our faith in Christ and God’s grace toward us. Glorification refers to the final moment when we will truly and completely be saved by being transformed into the likeness of Christ in heaven. Philippians 1:6 reminds us that we will one day be made perfect in Christ. This verse in James refers to the tine frame in between called justification. During this time, we have accepted Christ as Savior already, but we are still here on earth and so being made more like Him every day. This is where our actions come into play. Because we have been sanctified in Christ, we are daily seeking to be more like Him and our actions are the proof of that commitment in our heart and of God working in our lives. 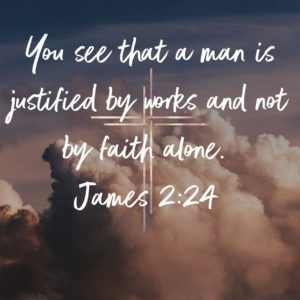 We are justified by our actions because that is the tangible, visible mark that we are allowing God to have more and more control in our lives. Have you been sanctified? Has there been a moment when you asked in faith for Christ to save you by His grace? If so, then one day you will be glorified in heaven by being made exactly in His likeness. In the meantime, are you allowing yourself to be justified by God each day and do your actions tell the world that you belong to Christ and are being changed by Him?